Why sunrooms have re-emerged as a popular feature in custom homes. Perhaps the better question is, did sunrooms ever go away? Over the years there have been times when sunrooms were incredibly popular, and other times when they weren’t. If you’re trying to decide if you want to include a sunroom in your custom home design, it mostly depends on your lifestyle. You should consider the pros and cons of a sunroom and discuss them with your new home builder in Greensboro before deciding one way or the other. The uses for a sunroom are virtually limitless. How you use it depends on your lifestyle and the needs and interests of your family members. It can be a transitional space that will change over the years as your family changes. The many windows can make insulation a challenge for sunrooms. The room can be hot in the summer, making cooling costs rise, but may actually be pleasant during the winter when the sun warms the room naturally. It may also be difficult to extend the central air to the sunroom, but that is more of a concern when a sunroom is added onto a home after it is already built. The biggest concern is probably the fact that most homeowners won’t recoup the expense of adding a sunroom in resale value. Again, this is more of a concern for homeowners that are adding sunrooms onto an existing home, rather than including it in the original plans drawn up by a new home builder in Greensboro. Window insulation technology has improved in recent years, making sunrooms more efficient to heat and cool. When you include a sunroom in your original home design, the central air can be extended to the room easily. The additional square footage the sunroom offers may be an advantage when selling the home in the future, especially if you plan on staying in the home for many years. The biggest advantage to custom home building is that your home can be exactly what you want. If you want a sunroom, have a sunroom. Don’t include one just because it’s the popular choice, and don’t let the drawbacks dissuade you from getting what you want. Weigh the pros and cons, think about your lifestyle, and discuss the options with your new home builder in Greensboro. New technology has made sunrooms much more efficient and useful for families. 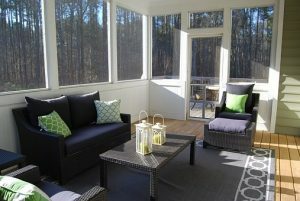 Your builder will know how to design a sunroom with the best possible benefits. Call R&K Custom Homes today to start planning your dream home, with or without a sunroom. (336) 643-3503.
https://www.randkcustomhomes.net/wp-content/uploads/2016/08/logo.png 0 0 Chaunte Rankin https://www.randkcustomhomes.net/wp-content/uploads/2016/08/logo.png Chaunte Rankin2018-09-25 15:50:292019-01-18 15:54:42Are Sunrooms Back?